It's just so very pleasant. Social media is not a pleasant place to be most of the time, but a lot of us are addicted to it anyway. When I really started to feel like the politics, hot takes, and endless stream of horrible news on Twitter were melting my brain, I began to follow every account I stumbled across that posted cool art. I still get some of the depressing stuff, but it's interspersed by beautiful artwork now. That stuff makes me happy. So does Wholesome Games, a new account that is really all about what it says on the tin: "Brightening your day with cute, friendly, colorful and welcoming videogames." This is not a complicated idea. It's a feed of screenshots and animated gifs from a range of bright, bubbly, cheery games. The text that accompanies those images is equally positive, mixing recommendations with personal stories. Here are some examples. The pureness and warmth of the enthusiasm here just makes me smile. I've learned about a few new games that I'm curious about. I mean, who wouldn't be curious about Catadel, a town builder with cats? There may be a glut of farming games these days, but wow does Summer in Mara look just beautiful and fun. And I really do need to play A Hat in Time one of these days. The way Wholesome Games so warmly presents these games actually makes me view some of them, ones I already knew about, in a different way. For example, take this tweet about Little Dragon's Cafe, a farming sim released on Steam back in November. Player reception to Little Dragons Cafe wasn't too hot, reviews were mixed, and I'd already forgotten it existed. If I decided I needed to play a farming life sim, I'd probably pick Stardew Valley, because I know it's great. But you know what? I really like this gif of Little Dragons Cafe. I enjoy looking at it, even if I'm not compelled to play it, and the reference to it being overlooked is a nice reminder that it's not only the best-in-genre games that make an impact on us. We may not have reviewed Crackdown 3 well, but that doesn't mean it can't be a lot of fun to play while listening to our favorite podcasts. Wholesome Games isn't just about PC games. It tweets about stuff on the Switch and sometimes old consoles. It's a nice mix. Scrolling through the feed reminds me of when I used to habitually browse Noirlac, a Tumblr devoted to the pixel art of old Japanese games. 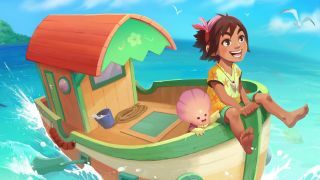 Wholesome Games adds more personality, but I'd happily settle for a steady stream of pleasant games, new and old, with a brief description. Anything more is gravy. Thanks for making Twitter just a little nicer, Wholesome Games.